Hotdogs, then! We were running with the hotdogs idea, thinking of doing a chili dog or some such dog, but then we decided we couldn't do it, because we most likely couldn't find the right kind of hotdogs. So what now? No hamburgers, no hotdogs? We thought of other "sandwich"-type things that seem to abound in the American culinary landscape. New England lobster rolls? Philly cheesesteaks? New Orleans po' boys? Although the sandwich was supposedly invented by the Earl of Sandwich, that is to say, a Brit, I think America can claim to a kind of "sandwich supremacy" now, given the sheer quantity, variety, and quality of its sandwiches. We were getting confused at the different sandwiches we could be making or the other set of sandwiches that we absolutely could not make. It was getting desperate, this pingpong-ing of ideas of sandwiches. That's why it's always a good thing when a turkey plops into a pot. That was our eureka moment. Since Wandering Chopsticks opened the door a tad and allowed the use the of term "America" to include Canada, why not do a soup to partner with the great sandwiches of America? The state of our freezer being what it is, it's often very hard to decipher what's inside freezer bags from their freezer-burned remains. I wanted to make some stock to make soup for dinner that night and I grabbed a large bag of what I thought to be chicken carcasses. I wasn't paying much attention, because TS and I were still discussing our possible entries for this event ad infinitum. I was surprised when a large-ish carcass plopped into the pot of water. Weird, I thought. I thought at first that it was two or three chicken carcasses frozen together. I went about my business. Once heated, the pot of carcasses started to smell very buttery. Weird again. I smelled again and inspected the mass in the water. There was only one carcass in there. This must be the salt-and-butter-rubbed turkey we had last Christmas. 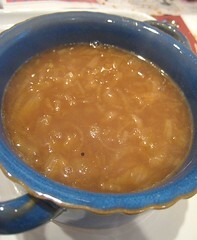 Given the richness of this stock, we decided to make onion soup. 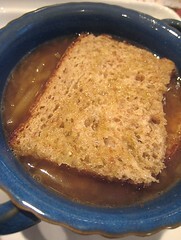 I saw Jamie Oliver doing what he called "English" onion soup with chicken stock (as opposed to "French" onion soup, I suppose, which is usually made with beef stock), so I thought, why not a "Canadian" onion soup with turkey stock? I was happy with the congruity. I was also happy that we finally had an entry. Canadian Onion Soup, it is! Besides the turkey stock, we had to use something even more "Canadian." A while back, when we would fast-forward through the commercials while watching Top Chef episodes, we would see, in frenetic speed, robed monks in various stages of cheese production. This footage was part of the Oka Cheese ad running at this time. We saw this ad, in fast motion, several times until I was intrigued enough to watch the ad for real. 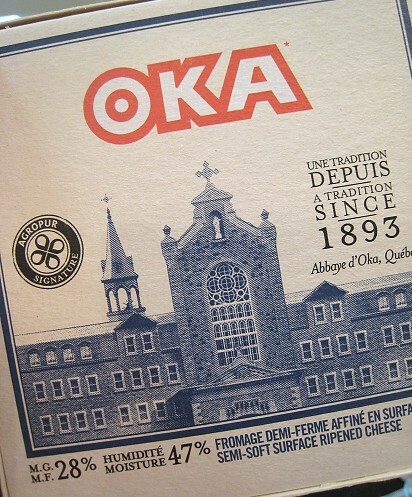 One day, at the better-than-normal Costco here, we spotted a tiny box of Oka Cheese. We put it into our cart without any plans on how to use it. 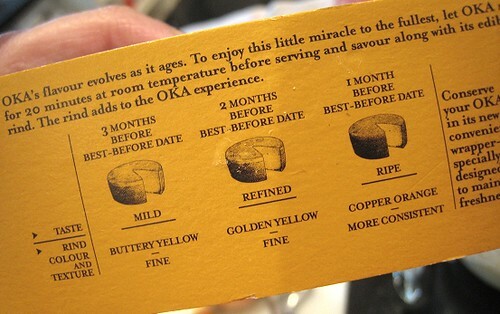 Lookee, you can eat it in various stages of aging! 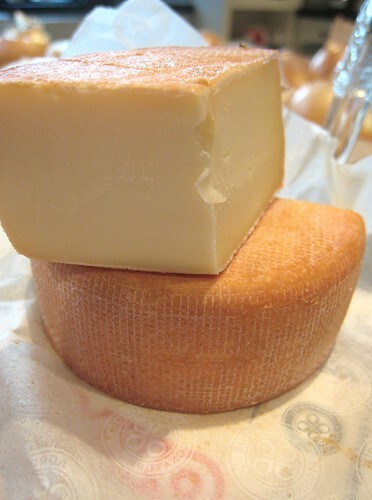 This oka cheese had a consistency like brick mozzarella and a mild flavor. I grated it for use later. 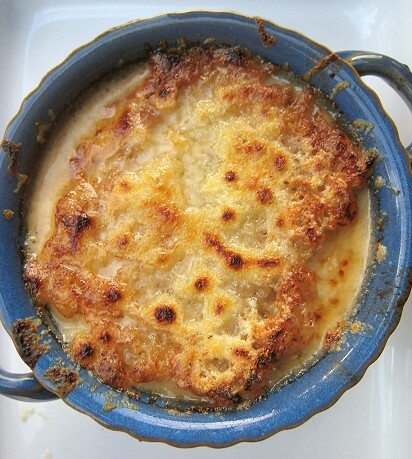 Onion soup is fairly simple to make. Patience is key, because the onions do need to get caramelized. After that, it's a matter of pouring the stock in and seasoning to taste. 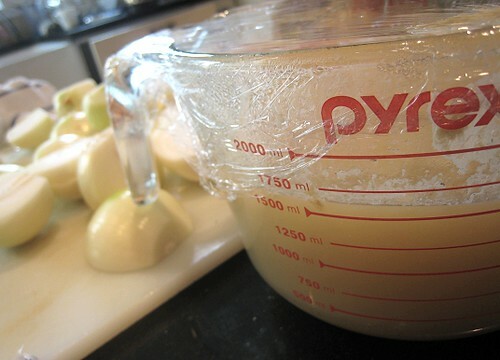 We used about 8 cups of turkey stock and around 8 large white onions. I heated some olive oil over medium heat then started sautéing the onions. I threw in a couple of cloves of garlic too. Eventually, the whole lot was caramelized and much reduced in volume. We could've added some herbs and such in the soup, but our turkey stock was quite fragrant with butter and sage, so I didn't think it was necessary this time. I deglazed the pot with some white wine. 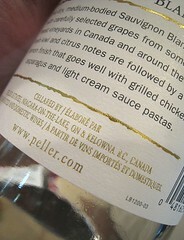 Hey, the opened bottle we had sitting in the refrigerator is a Canadian wine! This is turning out to be very Canadian indeed. Woohoo. I let the caramelized onions and white wine cook for a bit, then added the turkey stock. I let the mixture boil, then lowered the heat and let the soup simmer for about 30 minutes. I seasoned the soup with salt and pepper, and a touch of Worcestershire sauce. We ladled out our Canadian onion soup into individual portions. For the croutons, we had some breadmaker Country Loaf lying around so we decided to use that. Some garlic was rubbed on toasted, olive oil-drizzled slices of the bread because we do love garlic. 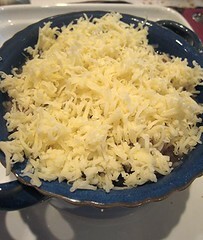 A piece of toast was placed on each bowl followed by grated Oka cheese. These were broiled under the oven to get the cheese browned and bubbly. So, is this onion soup Canadian enough? It's quiet, it's unassuming... but deep and substantial. Heat olive oil (and butter, if using) over medium heat. 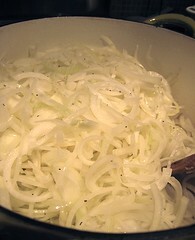 Add the sliced onions, herbs (if using), and garlic. Season with salt and pepper. Stir and cook until they are soft. 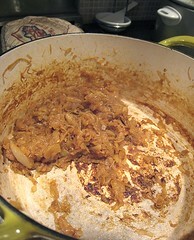 Turn heat to low and keep cooking, stirring occasionally, until the onions are caramelized. The darker they are, the more flavor they have. This can take anywhere from 30 minutes to 1 hour. Turn the heat to high, add the white wine and stir for about 1 to 2 minutes. Add the turkey stock and let the mixture boil. Once boiling, turn the heat down to low and let simmer for about 20 to 30 minutes. Adjust seasoning (salt and pepper) and add a dash of Worcestershire sauce, if desired. Keep warm. Toast each side of bread slices under the broiler. 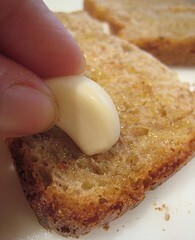 Rub the whole garlic clove over the toasted bread slices and drizzle each with olive oil. Ladle soup into individual bowls (6 to 8). Top each bowl with a slice of toasted, garlic-rubbed bread and divide grated cheese among the bowls. 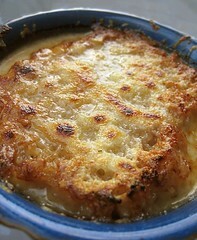 Place bowls on a baking sheet and place under the broiler until cheese is bubble and golden brown. Serve. We're submitting this to Regional Recipes, a blogging event created by Blazing Hot Wok that celebrates food from all over the world. The region for this edition is North America. The round-up will be hosted by us! Entries are due on April 15. Please submit them to email [at] eatingclubvancouver [dot] com. Wow! Eventhough it is rainy Spring down here in Georgia, I am sooooo inspired to make this (or something similar) this weekend. OMG this looks so perfect right now. Canadian onion soup. I love it. Well, I just picked "American," not specifically North American. So I guess that leaves the door open for the South Americans to assert themselves too. I just like playing around with terminology. I guess I could have said specifically "United States" cuisine, but I don't know of anyone who says that. I have a bunch of unknown carcasses in my freezer too! I bet that broth was wonderful and the soup with that cheese! Guess what I made for my entry...yep, a burger! It was either that or a chili dog. Oh! Corn! Well, that's a good starting off point, actually... maybe we can do another dish. Hehe. Thanks! This would still be good in rainy weather, I think. Hahaha... we were thinking, "What is American?! It has to be burgers and hotdogs!!" LOL. 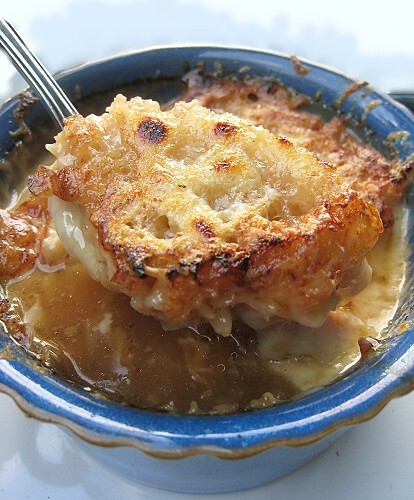 Great looking French onion soup! 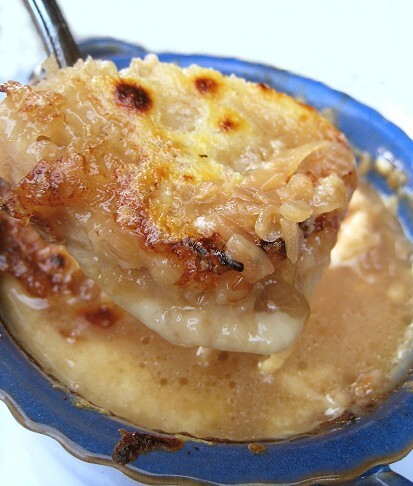 I love French onion soup but had never thought of making it French-Canadian onion soup. What a great idea!!! Aside from looking delicious in the photos, I think it's an upgrade from the traditional classic! I just love twisting tradition! Great job! I just found your site and I'm glad I did, it's very cool and I love its layout and your recipes! Thank you for the kind words! I've just scurried over to your blog as well. I've added it to my blog reader.